Kayaking experience in the beautiful backwaters of Nerul, come spend some leisurely time in the quite and serene environs. A 3-hour long session of kayaking. Become aware of the ecosystem while enjoying the kayaking activity. Spotting of various species of aquatic birds. Come explore the backwaters of Goa in a kayak. Kayaking makes it super-easy and fun to access and enjoy the dense mangroves which create narrow passages, canopies. You will have to report at the meeting point in Nerul, Goa at a time of your preference in the morning. Same can be consulted with the ground team after booking. Upon your arrival, a short briefing session with the kayaking instructor that involves the location, route, paddling technique and safety procedures. After you are well informed, the first 10 minutes will be spent to get the paddling technique right. Post which you will kayak through the dense mangroves, spot the birds and get up close with the mangroves. After a certain interval, you will break-out for some snacks and juice. And then again continue kayaking and exploring the mangroves. The kayaking session finishes at once you are back to the starting point. Complete the trip with memories that will last a lifetime. Service of an expert kayaking instructor. All required equipment - kayak, paddle and life jacket. Snacks, juice and drinking water. Photos and videos can be arranged at no extra cost. The trip timings will be dependent on the high tide timings of the day as the mangrove areas become inaccessible in low tides. You will be informed of the high tide timings for the date selected by you. Being relatively a dry activity, participants can carry their own phones/cameras for pictures and videos. There is a weight restriction of 100 kgs for this activity. 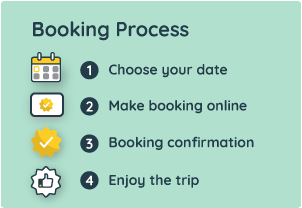 The exact reporting address, local contact person details and phone number are shared in the booking voucher, sent to you via email upon booking completion.